Set amongst the mystery of the Minoan Labyrinth and the heart-pounding thrill of the bull-dancing ring, The Year-God’s Daughter is the first volume of The Child of the Erinyes, a sweeping epic of a series spanning time from the Bronze Age to the near future. In Rebecca Lochlann’s first novel, we are introduced to Aridela, a young priestess and princess – and to the mysteries of Athene, the inscrutable goddess whose hand guides Aridela’s fate. Aridela is the youngest daughter of the queen of Kaphtor (Crete). She was born under portentious circumstances and has grown up revered and pampered in her mother’s palace. She is headstrong and strangely wise for her age, seemingly born to rule – yet her meek elder sister Iphiboë is the heir to Kaphtor, and Aridela is pledged to a life of celibacy and service to the goddess Athene. This novel, being the first in a long series, is largely set-up for events to come; yet The Year-God’s Daughter is packed with plenty of action. As the groundwork is being laid for the rest of the series, the reader follows Aridela through her coming-of-age – and follows, too, the lives of the people she touches, whose fates are altered by contact with this young woman chosen by Athene: Iphiboë, Themiste the high priestess, Selene the foreign warrior-woman, Lycus the bull-dancer, and more fascinating characters are subtly moved like pawns on a game board by Aridela’s unknowing influence. Most notable on the list of characters entwined with Aridela are Menoetius and Chrysaleon, half-brothers and sons of the king of Mycenae. They are sent on a mission by their power-hungry father to discern Kaphtor’s weaknesses so that Mycenae might take control of the rich island nation. But both brothers soon find themselves in love with Aridela…and at one another’s throats. The depth of historical information in this novel will delight fans of the genre. A surprising amount of history and archaeology has been slipped unobtrusively into the narrative. Lochlann has clearly done an astounding amount of research into her historical setting and culture, yet she never overwhelms the reader with specifics, nor does she lecture. The conveyance of historical facts and archaeological tidbits feels very natural, woven deftly into the dialogs and thoughts of her intriguing cast of characters. The primary strength of this book is the writing itself, which I can only describe as sumptuous. Lochlann has a great flair for sensory detail and fills her novel with such a wealth of sights, sounds, smells, and flavors that the reader feels absolutely immersed in the world of ancient Crete from the first page. 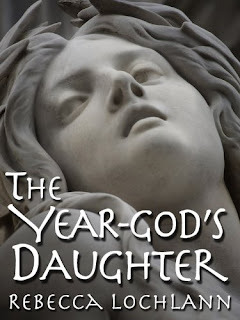 Reading The Year-God’s Daughter is a delicious experience – seldom have I read a historical novel with such a well-drawn setting, and the fact that this book is independently published makes the feat all the more remarkable. The rare grammatical gaffe occasionally pulled me out of the tale, but never for more than a moment – and while I often found myself wishing I understood some characters’ motives better, I have to assume that, since this is the first in a series with extreme scope, more will be made clear as the series progresses. In any case, the luscious sensory prose was more than enough to keep me reading, and has left me eagerly awaiting the next installment. The north wind brings a swift ship and two brothers who plot Crete's overthrow. Desire for this woman will propel their long rivalry into hatred so murderous it hurtles all three into an unimaginable future, and sparks the immortal rage of the Erinyes. The Year-God’s Daughter: Book One of The Child of the Erinyes by Rebecca Lochlann, published by Erinyes Press, 2011. 279 pages. Available in Kindle, Nook, and other electronic formats. Also available in paperback.